Are you looking for a complete book on the topic of magick? Well, look no further for you have found information that will open a new world before you. It matters not if you are a beginner or an advanced student of magick. 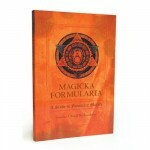 The information in the Magicka Formularia is presented in ways that are easy to understand, and you will find yourself referring to this beautiful book again and again. For this book is about formulary magick. It will teach you how to create the right “formula” for the change you want to make in your life. Based on Old European Witchcraft, the Magicka Formularia is written towards those practitioners of the Wiccan religion. The book is divided into three sections. The first section covers the ethics of magick and deals with the dark side as well. The types of human spirits are presented, together with topics such as the elements, colors, the pentacle, the moon, and types of candles. In the second section, many rituals are given. The spells were successful ones created by Witches of the Old Religion. Learn how to deal with everything from love and money to protection from vampires! In addition, the ancient recipe for the Witches’ Bottle is shown. The last section is about the prayers of the Sacred Covenant. They are powerful words that lots of people have taken comfort from. The prayers are actually used in public rituals today! The Magicka Formularia is a magician’s handbook that anyone interested in magick will benefit from, whether they be a Witch or not. Check out this book and see for yourself how useful it will be in your life. You have found an excellent grimoire for all your magickal needs.